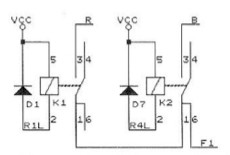 If the switch motor driver does not provide for frog polarization, it can be handled by the switch object provided the switch command is acknowledged. The bus to use for the frog commands. The switch interface bus is used in case this value is not set. The default is zero which will use the wiring event. The timer units are in ms and ranges from 0 to 1000. For single and dual slip switches. 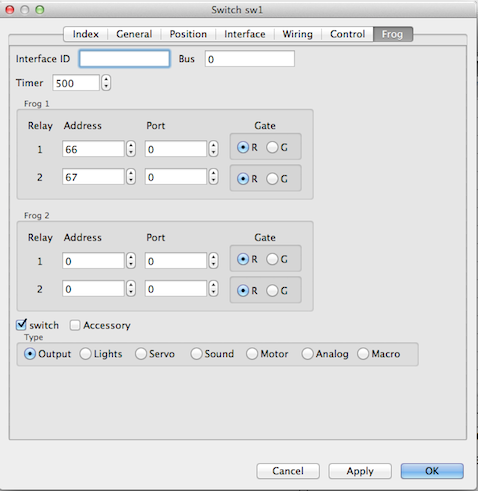 Switch commands are send instead of output commands when this option is set. The addressing depends on the Command Station or Bus System that is used. Switch both relays off to isolate the frog. Command the servo to go to a position. Switch the relays to polarise the frog. Do not use them parallel to avoid double commandos. Do not use them parallel to avoid double commands.